When the Redding weather get's cold you need a reliable HVAC company you can call for heater repair. Bickley's Air Conditioning & Heating repairs all brands of heating systems in Redding. If your heater cannot be repaired, we can help you choose a new heating system made by brands we trust. If you are looking to save energy, our heating technicians can install high efficiency gas furnaces. We offer regular furnace tune-up services that will help extend the life of your heating system. Bickley's service technicians are experienced in troubleshooting & repair of all brands of furnaces and heaters in Redding. 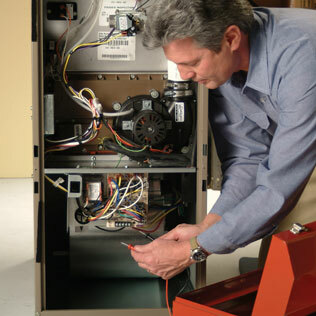 Our technicians will be able to repair your heater or gas furnace right away, the first time. We arrive with the tools & parts to get your heater working. If you need heating repair in Redding call Bickley's! We provide dependable heating service in Redding, CA. For new construction, retrofit or heating replacement needs, you are at the right Redding HVAC contractor website! We sell highly efficient products with high annual fuel utilization efficiency (AFUE) ratings to provide you with much lower utility bills during the winter season. Annual maintenance of your heating system is the key to its long life and energy efficiency. Thorough, comprehensive furnace tune up will prevent small problems from becoming big problems and ensure optimal performance of your system. Keep your heating running efficiently and effectively by scheduling a seasonal tune up. A tune up of your furnace can prevent a more costly, serious problem in the future. Call us for a heating tune-up before your system breaks down. You depend on your furnace to keep your indoor space comfortable and warm when the weather turns cold. So when your furnace starts to malfunction and reaches the point where it can't be repaired, you need a reliable contractor to come in and replace it at once. That's where Bickley's comes in. We offer homeowners furnace replacement in Redding. We recently had a new furnace installed by two of your technicians. I cannot sing their praises enough! Not only were they professional but also efficient. While on the roof they noticed our cooler was leaking so he installed a shut off switch and drained it for us. No more leak. Then when the heater made a funny noise, they were quick to come right over and fix the issue! On their way out I noticed I had no hot water and they even fixed that for me. I am so so grateful!